Gardening advice for tiny gardens. Practical Small Space Gardening ideas. Small garden spaces, like a patio or a tiny yard, are full of possibilities for growing productive gardens. Check out our ideas for tiny gardens. Small spaces require special considerations when planning a garden. Tiny gardens require some creative thinking. 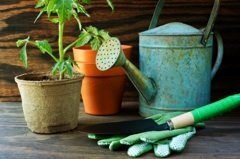 Fortunately there are tons of options for gardening in small spaces such as container gardening, raised bed gardening, and square foot gardening. Examine your available space for sunny areas and don't forget to look up, hanging planters can be turned into beautiful vegetable planters or flower displays and vertical spaces can be pressed into use. In extremely small spaces, container gardening may be the only option for a garden. Hanging containers and containers with trellises use vertical space to grow plants. Large decorative pots can be used to create a garden room or add privacy by screening out neighbors and street noise. Hanging baskets make the most of vertical space. Flowers and vegetables can be grown in a hanging container. Almost any plant can be hung from a window or roof overhang. Living wreaths are another type of hanging planter. These wreaths can be grown and hung on the side of the house or on a door. Create macrame plant hangers to turn any container into a hanging planter. Raised bed gardening is a form of container gardening except that the container is a garden bed that is raised above ground level. This can be as simple as a mound of earth. Other raised beds are made from hay bales, wood, and some are just large bags of soil with holes cut in for the plants. Small space gardening can make use of raised beds. A simple bale of hay can become a planter. Dig holes for the plants into the hay and fill with soil. Allow this to age for a month, watering daily. Then add more soil and plants to the hay. This has the added bonus of providing food for the plant as the hay decomposes. In winter, the decomposing hay can be used as a hot bed to grow plants during the winter. Square foot gardening is a way of intensively planting a garden bed to maximize yields. Most square foot gardens are planted in raised beds that are divided into one square foot sections. On average each plant takes up one square foot of space. Close spacing allows for more plants per garden bed therefore yields are increased. Large plants such as tomatoes, winter squash, and pumpkins use more than one square foot of space. Smaller plants such as radishes, peas, scallions, garlic, and greens use less than one square foot of space. Square foot gardening incorporates all of the same principles used in small space gardening. Maximizing garden space is what this gardening technique is all about. Use every available inch of space when planning a garden for small spaces. A small indoor table can hold a pot of salad greens. The kitchen window is a great place for a hanging pot of mixed culinary herbs. Grow dwarf fruits such as Top Hat blueberries in containers set out on a patio or terrace. Privacy screens can be made by using cherry tomato plants set out in a row of containers. These screens are portable and they produce wonderful tomatoes for cooking. A small water garden can be made from a large glazed pot. Another option is to use a freestanding water fountain and grow water plants in it. Try using a tiered garden for strawberry container gardening. These tiered beds save space and triple your strawberry growing capacity. You can make your own or purchase them from a local garden store or online. Small space gardening has its challenges. Maximize the planting area by growing plants vertically. Use trellises and hanging containers to add growing space. Even though space is at a premium you can turn even the smallest outdoor area into a garden oasis by using containers. Visitors to our Small Space Gardening page may also be interested in the following pages.